Check out our review of this lift on Jeepin.com. SuperFlex adjustable upper control arms now standard! The RE6200 Extreme-Duty 5.5-inch suspension system is the ultimate suspension for XJ's running factory short arm suspension geometry. It offers you the perfect combination of price, street performance, and enhanced trail capabilities. Designed for heavy trail-running, this suspension system is nearly indestructible. 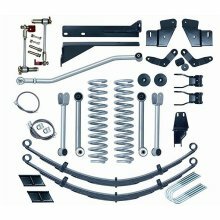 The heavy-duty track bar and front control arm relocation brackets allow for optimum flexibility and improved suspension geometry for better on-road ride compared when compared to lesser kits. 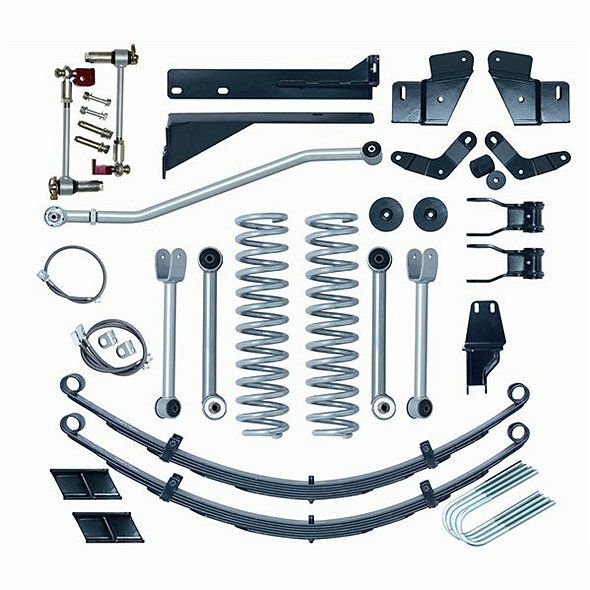 The kit is designed as a complete replacement suspension and includes our Extreme-Duty™ rear leaf springs and front coil springs. Other components include new control arms with our Super-Flex spherical ball joints and Gen II sway bar disconnects. This is the best XJ lift available that retains the factory short arm design. This suspension allows the use of 35x12.5" or larger tires with proper trimming. We recommend installing a slip yoke eliminator and CV driveshaft on stock NP231 or NP242 transfer cases. Over 3.5-inches of lift on a full-time NP242 unit may cause unacceptable vibrations on the front driveshaft, when driven in ”full-time”, constant use 4WD high range. NOTE: This system can easily be upgraded to our Extreme-Duty™ XJ long arm suspension system at a later date. RE1345 ~ COIL SPRINGS XJ-5.5 / ZJ-4. RE1515 ~ BRAKE LINE SS REAR 18"
RE1550 ~ BRAKE LINE SET SS FRONT 22"
RE2120 ~ T-CASE LOWERING KIT XJ/ZJ 3/4"
RE2700 ~ SHACKLE XJ REAR 5"